When we developed the Neuland No.One® in 1994 the clever ergonomics and the simple refilling of the marker was a central requirement. Especially today, this requirement has lost nothing of its meaningfulness. On the contrary – sustainability and business management are more important than ever. Why throw something away that can quickly and easily be made functional again for relatively "small" money? In addition to the unquestionably important ecological reasons, there are also very practical aspects that speak for markers of the Neuland No.One® and Neuland BigOne® line. For example, the ergonomic finger grooves which make you hold the marker almost automatically correct to be able to write "facilitation-appropriate". Or the practical roll brake which prevents the marker from rolling off the table. The marker for the small format: the refillable Neuland FineOne® Art. 10 Replacement round nibs for the Neuland No.One® Outliner, round nib 2-3 mm. 10 Replacement round nibs for the Neuland No.One® Whiteboard. 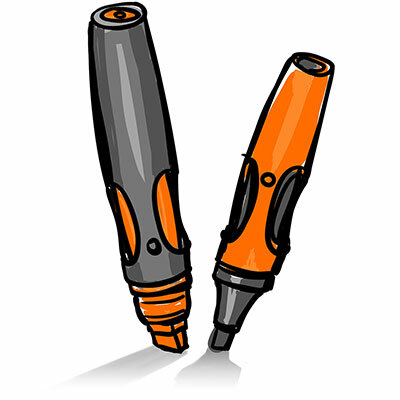 10 Replacement brush nibs for the Neuland No.One® Art and Neuland No.One® Outliner. 10 Replacement wedge nibs for the Neuland BigOne®. The practical Novario® box with space for up to 8 Neuland BigOne® markers! Novario® box in size of the CardBox with space for up to 12 Neuland BigOne® markers! The ingenious magnetic holder for the Neuland BigOne®. Set of 4 pieces. The ingenious magnetic holder for the Neuland No.One®. Set of 4 pieces.